People can see the special illuminated artworks by boat from the water, but there is also a special trail along. 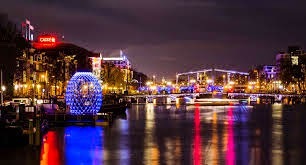 The light sculptures and projections are both from Dutch and international artists and the Amsterdam Light Festival lasts fifty days. "Just before Christmas we have 30 percent more visitors than in the same period last year. We expect to continue this upward trend during the Christmas holidays, "says director of the festival, Raymond Borsboom. According to a spokeswoman for the organization of the census has been established on the basis of measurements and boat tickets sold through wifi and bluetooth on some specific places on the route.